Professional Industrial support for wood, gas, and oil boilers. Please take a moment to browse our brochure or contact us for more info!. Moss firebox firetube solid fuel boilers provide large radiant and convection sections for conservative steam supply for the process load. Our firebox boiler offerings range in size from 150 - 600 HP with design pressures from 15 - 150 PSIG. These boilers can also be provided for hot water applications. Extended mud legs are generally supplied on Moss firebox boilers providing extra furnace volumes and lower heat releases. These large conservative combustion and radiant zones promotes complete combustion with approximate heat releases of 20,000 BTU/cu. ft. or less. This conservative design allows for lower particulate, CO and NOx emissions while extending refractory life. These extended mud legs also promote faster steam production. The firetube convection zone of our boiler is conservatively designed to scrub gases efficiently and produce steam quickly. An automatic sootblower system is available as optional equipment and is strongly recommended for extended runtime between boiler tube cleanouts. 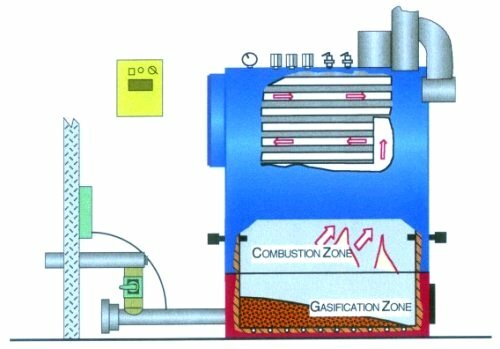 This boiler design can be used with either our gasifier combustion system.